Higher education has been financialized, transformed from a public service into a lucrative cash cow for private investors. Slavery is likely to be abolished by the war power and chattel slavery destroyed. This, I and my European friends are glad of, for slavery is but the owning of labor and carries with it the care of the laborers, while the European plan, led by England, is that capital shall control labor by controlling wages. This can be done by controlling the money. The great debt that capitalists will see to it is made out of the war, must be used as a means to control the volume of money. . . . It will not do to allow the greenback, as it is called, to circulate as money any length of time, as we cannot control that. The government, too, had to be enslaved by debt. It could not be allowed to simply issue the money it needed to meet its budget, as Lincoln’s government did with its greenbacks (government-issued US Notes). The greenback program was terminated after the war, forcing the government to borrow from banks – banks that created the money themselves, just as the government had been doing. Only about 10% of the “banknotes” then issued by banks were actually backed by gold. The rest were effectively counterfeit. The difference between government-created and bank-created money was that the government issued it and spent it on the federal budget, creating demand and stimulating the economy. Banks issued money and lent it, at interest. More had to be paid back than was lent, keeping the supply of money tight and keeping both workers and the government in debt. 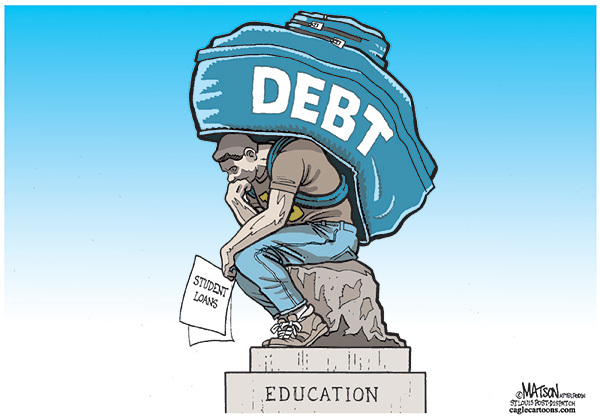 Slavery by debt has continued to this day, and it is particularly evident in the plight of students. Graduates leave college with a diploma and a massive debt on their backs, averaging over $37,000 in 2016. The government’s student loan portfolio now totals $1.37 trillion, making it the second highest consumer debt category behind only mortgage debt. Student debt has risen nearly 164% in 25 years, while median wages have increased only 1.6%. Unlike mortgage debt, student debt must be paid. Students cannot just turn in their diplomas and walk away, as homeowners can with their keys. Wages, unemployment benefits, tax refunds and even Social Security checks can be tapped to ensure repayment. In 1998, Sallie Mae (the Student Loan Marketing Association) was privatized, and Congress removed the dischargeabilility of federal student debt in bankruptcy, absent exceptional circumstances. In 2005, this lender protection was extended to private student loans. Because lenders know that their debts cannot be discharged, they have little incentive to consider a student borrower’s ability to repay. Most students are granted a nearly unlimited line of credit. This, in turn, has led to skyrocketing tuition rates, since universities know the money is available to pay them; and that has created the need for students to borrow even more. Students take on a huge debt load with the promise that their degrees will be the doorway to jobs allowing them to pay it back, but for many the jobs are not there or not sufficient to meet expenses. Today nearly one-third of borrowers have made no headway in paying down their loans five years after leaving school, although many of these borrowers are not in default. They make payments month after month consisting only of interest, while they continue to owe the full amount they borrowed. This can mean a lifetime of tribute to the lenders, while the loan is never paid off, a classic form of debt peonage to the lender class. All of this has made student debt a very attractive asset for investors. Student loans are pooled and repackaged into student loan asset-backed securities (SLABS), similar to the notorious mortgage-backed securities through which home buyers were caught in a massive debt trap in 2008-09. The nameless, faceless investors want their payments when due, and the strict terms of the loans make it more profitable to force a default than to negotiate terms the borrower can actually meet. About 80% of SLABS are backed by government-insured loans, guaranteeing that the investors will get paid even if the borrower defaults. The onerous federal bankruptcy laws also make SLABS particularly safe and desirable investments. But as economist Michael Hudson observes, debts that can’t be paid won’t be paid. As of September 2017, the default rate on student debt was over 11% at public colleges and was 15.5% at private for-profit colleges. Defaulted borrowers risk damaging their credit and their ability to borrow for such things as homes, cars, and furniture, reducing consumer demand and constraining economic growth. Massive defaults could also squeeze the federal budget, since taxpayers ultimately cover any unpaid loans. It hasn’t always been this way. Until the 1970s, tuition at many state colleges and universities was free or nearly free. Education was considered an obligation of the public sector, and costs were kept low. After World War II, the federal government invested heavily in educating the 15.7 million returning American veterans. The goal of the Servicemen’s Readjustment Act of 1944, or G.I. Bill, was to facilitate their reintegration into civilian life. By far its most popular benefits were financial assistance for education and housing. Over half of G.I.s took advantage of this educational provision, with 2.2 million attending college and 5.6 million opting for vocational training. At that time there were serious shortages in student housing and faculty, but the nation’s colleges and universities expanded to meet the increased demand. The G.I. 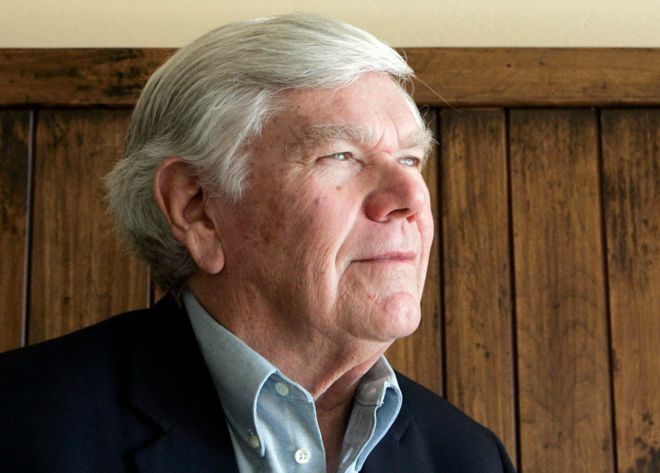 Bill’s educational benefits helped train legions of professionals, spurring postwar economic growth. It funded the education of 450,000 engineers, 240,000 accountants, 238,000 teachers, 91,000 scientists, 67,000 doctors and 22,000 dentists, 14 future Nobel laureates, two dozen Pulitzer Prize winners, three Supreme Court justices, and three presidents of the United States. Loans enabled by the bill also boosted the housing market, raising home ownership from 44% before the war to 60% by 1956. Rather than costing the government, the G.I. Bill turned out to be one of the best investments it ever made. The legislation is estimated to have cost $50 billion in today’s dollars and to have returned $350 billion to the economy, a nearly sevenfold return. That educational feat could be repeated today. The government could fund a public education program as Lincoln did, by simply issuing the money or having the central bank issue it as a form of “quantitative easing for people.” Infrastructure funded with government-issued US Notes in the 1860s included not only the transcontinental railroad but the system of free colleges and universities established through federal land grants. The exponential rise in college costs occurred only after the government got into the student loan business in a big way. The Higher Education Act of 1965 was part of President Lyndon Johnson’s Great Society agenda, intended “to strengthen the educational resources of our colleges and universities and to provide financial assistance for students in postsecondary and higher education.” The Act increased federal money given to universities, created scholarships, gave low-interest loans for students, established a National Teachers Corps, and included a PLUS loan program that allowed parents of undergraduate and graduate students to borrow up to the full cost of attending college. Unfortunately, the well-intended Act had the perverse effect of driving up tuition costs. The availability of federally guaranteed loans allowed colleges and universities to raise their prices to whatever the market would bear. By the mid-1970s, tuition was rising much faster than inflation. But costs remain manageable until the late 1990s, when the federal student loan business was turned over to private banks and investors with aggressive collection practices, converting federally-guaranteed student loans from a public service into a private investor boondoggle. Meanwhile, in many countries in Europe university tuition is still free, including Denmark, Estonia, Finland, Germany, Norway, Slovak Republic, Slovenia, Sweden and Turkey. But providing an affordable education for the next generation is evidently not a priority with our government. Only 3 percent of the federal budget is spent on education – not just for college loans but for school programs of all sorts, from kindergarten through graduate school. Compare that to the outlay for military spending, including the Veterans Affairs and other defense-related departments, which consumes over half the federal budget and is an obvious place to cut. But there are no signs that our government is moving in that direction. What then can be done to relieve the student debt burden? Stay tuned for Part 2. Astronomically high college tuition facilitated by a bottomless ocean of student loans has saddled Americans with a record $1.48 trillion in non-dischargeable debt – an amount which has more than doubled since the 2009 lows. As we reported in January, nearly 40% of student loans taken out in 2004 are projected to default by 2023 according to the Brookings institute. 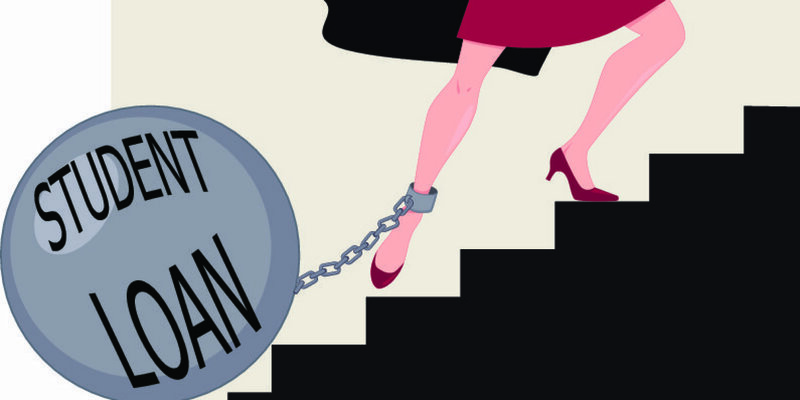 While in March we noted that debt-laden millennials were set back an average of $140,000 vs. their parents – a problem compounded by the fact that students aren’t just borrowing money for tuition; their student loans cover rent, food and other bills, leaving them with massive interest payments and in many cases, little prospect of getting ahead – much less saving for retirement. While millions of Americans are drowning in student loans – 101 people have the ultimate albatross around their necks; student loan balances exceeding $1 million, according to the Wall St. Journal. Five years ago, there were just 14 people with loans that large. Utah orthodontist Mike Meru, 37, is one of them. After graduating from Brigham Young University with no debt and a new marriage, Meru borrowed $601,506 debt to attend USC’s orthodontics program – while his new wife Melissa finding work as a USC administrative assistant to save on tuition. After a few years, his student loan had swelled to $1,060,94. (Reuters) – A federal judge rejected the University of California at Berkeley’s bid to dismiss a lawsuit claiming it discriminated against conservative speakers like Ann Coulter by imposing unreasonable restrictions and fees on their appearances. In a decision late Wednesday, U.S. District Judge Maxine Chesney in San Francisco said two conservative groups could pursue claims that the school applied its policy for handling “major events” and an earlier policy for “high-profile speakers” in a manner that unfairly suppressed conservative speech. But the judge also said she was “unpersuaded” by claims by the plaintiffs that the school engaged in intentional viewpoint discrimination, and that the major events policy was too vague. She said the plaintiffs could not seek punitive damages. The Berkeley College Republicans and the Young America’s Foundation, a Tennessee group, had sued after the university canceled Coulter’s scheduled speech last April 27, citing security concerns. Janet Napolitano, president of the University of California, was also named as a defendant. 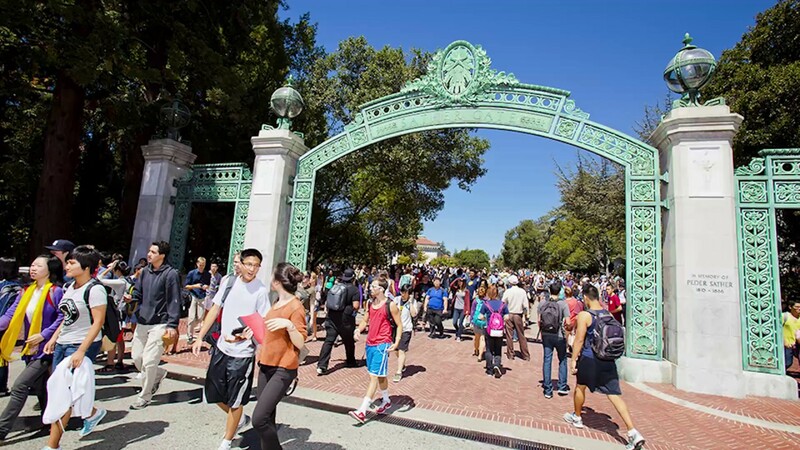 UC Berkeley is known as the birthplace of the student-led Free Speech Movement of the 1960s. Like other schools, it has tried to welcome different views without jeopardizing safety or its educational mission. The major events policy was adopted in July, and gave school officials discretion to take various steps to ensure security. Chesney said the plaintiffs may pursue an equal protection claim over a security fee charged for an appearance by conservative commentator Ben Shapiro that was well above a fee at the same venue for Supreme Court Justice Sonia Sotomayor, part of the court’s liberal bloc. In an very in depth story by the BBC, a man who was a New Mexico teacher ended revealing a secret that may or may not surprise you, he could not read or write for 17 years of his teaching. The entire article reveals how John Corcoran gamed the system without ever learning how to read or write and achieved teacher status at the same time. BBC: When I was taking a test I would look at someone else’s paper, or I’d pass my paper over to somebody else and they’d answer the questions for me – it was fairly easy, amateur cheating. But when I went off to college on a full athletic scholarship it was a different story.